The schnauzer is an exciting animal to see and to own. The clean, sharp beauty of this breed is impressive. The lively individualistics personality of the schnauzer makes him a joy to live whit. The schnauzer is truly one of the most versatile of all breeds. he is small enough for a woman to handle, yet large enough for even the manliest of man. He is robust and sturdy enough to be a working dog, yet small enough in stature so as not to be owerwhelming. His ideal size, combined with this breed´s properly maintained coat that has minimal shedding and ”doggy odour”, lead many people to think that this is the dog for everyone. However, nothing could be further from the truth. The breed´s combination of intelligence and high spirit can make the schnauzer more than an handfull for a lot of families. This is the dog that many fanciers refer to as ”the dog whit the human brain”. Of course, the highly intelligent brain inside this sometime very quick, active,aglie body, when trained properly, does makes the breed a very sensible and reliable working dog….proper training being the key. The mind of the schnauzer does not develop his full personality as a kennel dog. 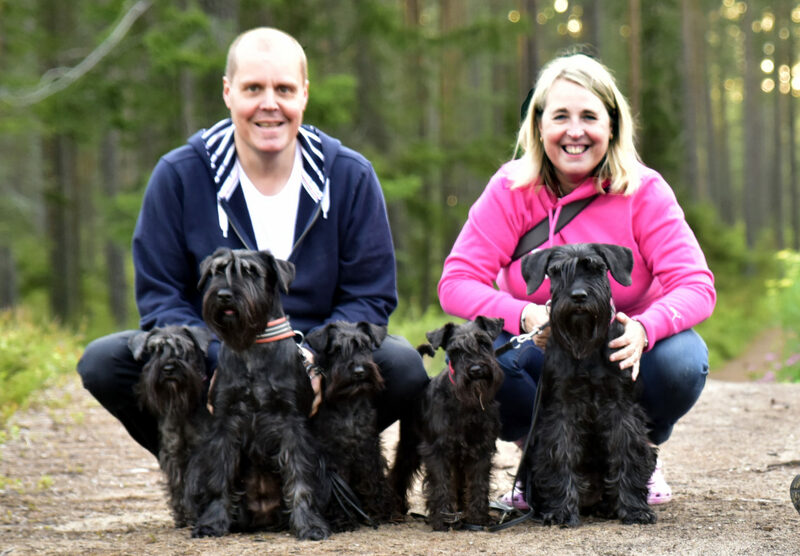 The schnauzers mind develops best whit close interactions whit his human family. The breed in general has a very clever, inquisitive and sometimes creative bent. These dogs can also have mischievous and sometimes stubbornly determined minds. The schnauzer has a very strong sence of self-dignity and the dog can be non-forgiving to people and children that have a propensity to tease dogs. It is not wise to belittle the schnauzer with needless tricks; he seems to need a reason for everything. Although he does have a sence of ”dog humour”at times, in reality he takes his job as guardian of the home very seriously. The family home nad car belongs to the schnauzer, and an unannounced visit brings out his deep bark, that from behind the closed door, belies his medium size. He is exceptionally alert to his surroundings and aware of every changes in it. His reaction is to hold rather than to attack and, unless provoked, has been known to keep an intruder cornered for quite a long time. Pity is to the letter carrier or delivery boy who does not take time to make friend whit this very big dog in a medium.sizes package. His intense attitude at the garden gate inspires respect from all who pass.